What am we waiting on this week? THIS! Why am I waiting? Um...that cover has kissing on the mount! Yeah, that's enough. Why am I waiting? Well, I've already told you about my Molly McAdams addiction, yes? Take that addiction and multiply it by four. THAT IS THIS BOOK. 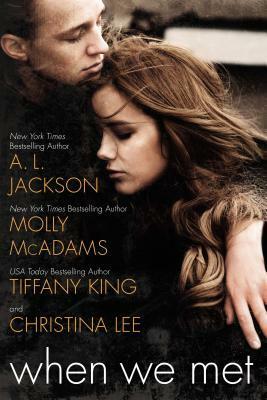 I'm always up for a Molly McAdams book, I super love Tiffany King, Christina Lee is awesome, and A.L. Jackson is icing on it all. Plus, the premise of four separate stories that all interconnect throughout a year sounds so great. I seriously can't wait to get my hands on this beauty!!! Those both sound great and they are new to me! Gotta check them out! I love baseball-centered sports romance! This looks good. And, I have a copy of When We Met and will probably give it a try!